Ten youth from Oneida Tribe of Indians of Wisconsin process local fruit as part of the Oneida Youth Food System Entrepreneur Project. LONGMONT, COLORADO – For thousands of years, Native communities in the Americas sustained themselves through a rich variety of complex food systems, each adapted to local cultural and environmental conditions. The traditional ways of planting, gathering, fishing and hunting led to balanced diets, good health and enduring cultures. Today, American Indians, Alaska Natives and Native Hawaiians suffer from alarmingly high rates of diabetes, heart disease and other diet-related illness. Among American Indian children, 31.2 percent of four-year-olds are obese, a higher rate than for any other racial or ethnic group in the United States. Tooth decay is five times higher among Native children ages two to four than the U.S. average. At the same time, the poverty rate in Indian Country is 27.3 percent, nearly twice the national rate. In many Native communities, the challenges of food insecurity and chronic disease are compounded by limited access to grocery stores and fresh produce, high food prices and the disappearance of Native food traditions, threatening children and families, as well as future generations. One key to meeting both the health and economic challenges faced in Indian Country, according to First Nations Development Institute (First Nations), lies in reclaiming Native food systems. Based in Longmont, Colo., First Nations has worked for more than 30 years to provide funding and technical resources to Native organizations in support of American Indian economies and healthy Native communities. With funding from the W.K. Kellogg Foundation (WKKF), First Nations launched the Native Agriculture & Food Systems Initiative (NAFSI) to help tribes and Native communities strengthen their local food systems, build food security and improve health and nutrition. NAFSI began in 2012 to award 10 to 12 grants each year for three years. Each one-year grant averages $37,500 and is offered to Native American-controlled, nonprofit, tribal organizations and community-based groups engaged in increasing the availability of healthy, locally-produced foods in Native communities. NAFSI grants have helped the Muckleshoot Food Sovereignty Project at Northwest Indian College in Bellingham, Wash., to develop gardens, provide food-related educational opportunities, create a food sovereignty plan and use a community kitchen to create healthier, traditionally-based meals. The STAR School in Flagstaff, Ariz., partnered with the Navajo Nation’s Sandsprings Farm to pilot the first farm-to-school project in northern Arizona as a model for Navajo and Hopi schools and farms. And Waimea Hawaiian Homesteaders’ Association Inc., in Kamuela, Hawaii, helped Native Hawaiians with land allotments begin farming fallow land and growing fresh produce for themselves and the community. One NAFSI grantee, the Oneida Tribe of Indians of Wisconsin, facilitated an eight-week summer program to develop business skills and interest in agriculture and food industry careers among Oneida youth. The Oneida Youth Food System Entrepreneur Project educated students about the origin of natural, healthy foods, and also about the local food supply chain. The 10 youth selected for the project learned how to use business software and created a business plan for a trail mix. They harvested strawberries and raspberries and worked with the Oneida Cannery to dehydrate the fruit and process ingredients. A tribal elder taught the youth about indigenous food sources. 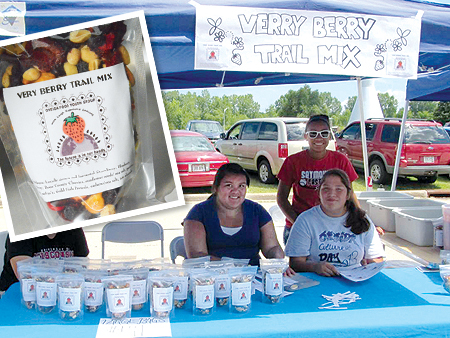 Finally, the youth sold their mix at the Oneida Farmers Market. Editor’Note: This article was first published by the W.K.Kellogg. Foundation. Used with permission. All rights apply. Say no to GMO’s. Yes natives do know what this is Kellogg.